These four releases are "two-fers" – two discs for the price of a single mid-priced disc. Additional releases in this series have been devoted to Thomas Hampson, Beverly Sills, Mirella Freni, and other singers who have recorded extensively for EMI Classics. Canadian tenor Jon Vickers began his operatic career in 1952, and retired in 1988. Early on, he sang lighter roles such as the Duke of Mantua (Rigoletto) and Ferrando (Così fan tutte), but as his career progressed, he moved into the heavier and more dramatic roles for which he is remembered today. (Some of these, such as Peter Grimes, Radamès, and Aeneas from Les Troyens are not represented here, because he recorded them for a different label.) He was an excellent actor, and an intelligent singer. His voice, while not beautiful per se, was immediately recognizable for its masculinity, and for the canny way in which head tones (which some find croony) and chest tones were intermixed. 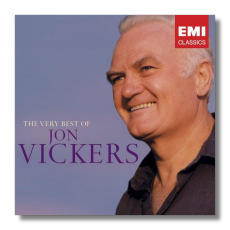 As with many of the other "Very Best of" releases, the Vickers collection is heavily dependent on complete recordings. In the 1960s and 70s, Vickers recorded Samson with Georges Prêtre, Carmen with Rafael Frühbeck de Burgos, and Otello, Fidelio and Tristan with Herbert von Karajan, and generous excerpts from those five more or less recommendable sets have been included here. As a result, there is a certain amount of fading in and out of excerpts, so if that bothers you, consider yourself advised. Karajan is a galvanizing conductor, and soprano Helga Dernesch adds excitement to both Tristan and Fidelio. At the time of its release, the Carmen (with Grace Bumbry in the title role, and Freni as Micaëla) was considered rather ho-hum, but these excerpts are exciting, and Vickers's head tones at the end of the "Flower Song" are unearthly in their beauty. (Nevertheless, he was anything but a wimpy Don José .) The Ingemisco from Verdi's Requiem comes from Barbirolli's complete recording (another undervalued pleasure) and four songs from Winterreise come from a fine recording that Vickers, near the end of his career, made with pianist Geoffrey Parsons. It is shame to excerpt Winterreise, though. (This is the only digital recording in this compilation.) Most of the original recordings still give pleasure, although the Samson excerpts suffer from distortion. Boris Christoff also possessed a voice of such resonant blackness that you could mistake it for no one else's. Because he performed so much Russian music, it often was assumed that he was Russian. In truth, he was Bulgarian. His studies with Riccardo Stracciari prepared him for Italian roles such as King Philip II (Don Carlos) and Attila, but it is his portrayal of Mussorgsky's Boris Godunov for which he is best remembered today. (That, and his interpretation of Méphistophélès in Gounod's Faust.) Sadly, he never appeared at the Metropolitan Opera, although he was heard in San Francisco, and also in Chicago over the course of several seasons. He was a larger than life actor, and his flamboyant interpretations (even on record) did not please everyone. 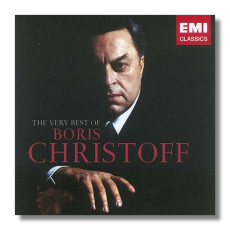 Christoff recorded Boris twice for EMI – once in mono, and again in stereo; eight excerpts from the latter recording are offered here. Critics were outraged that he sang not only the title role, but also Pimen and Varlaam on both recordings. Christoff seemed unwilling to relinquish any of the juicy music, as long as it was in his range. The same happened in Prince Igor (two excerpts here) where Christoff sang both Prince Galitsky and Khan Konchak. Even the complainers agreed that Christoff's unique abilities allowed him to differentiate multiple roles in the same opera, even when he was, in effect, singing to himself (as happens near the end of Boris)! As Faust provides no roles suitable for the bass other than Méphistophélès, Christoff had to content himself with singing of the most mustache-twisting malevolence. Here, EMI offers three excerpts, including the complete Church Scene, in which Christoff mercilessly (and unforgettably!) torments Victoria de los Angeles's Marguerite. Another highlight of this compilation is Mussorgsky's complete song cycle The Nursery, in which the basso convincingly transforms himself into a little boy! Again, some of the operatic excerpts are bleeding chunks, but fade-ins and fade-outs have been managed well. About one-third of the selections are monaural, recorded as they were in the 1950s. (Tchaikovsky's None but the lonely heart is in stereo, however, EMI's annotations notwithstanding.) Mono or stereo, the sound is excellent throughout, with none of the distortion that mars Vickers's Samson excerpts. 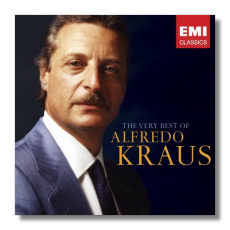 Like Christoff, Alfredo Kraus remained an EMI Classics artist throughout most of his career. It is for that reason that this compilation extends from the early 1960s (two arias from Così, as conducted by Karl Böhm) up to a live recording from December 1987 ("Una furtiva lagrima" from L'Elisir d'amore and "Salut! demeure chaste et pure" from Faust). Kraus, who was born on September 24, 1927 in the Canary Islands, was 60 at the time, and hardly less of fresh of voice than he was in the Così recording. Kraus was a lyric tenor who never sounded juvenile. In lighter bel canto roles such as Ernesto (Don Pasquale) a more youthful vocal persona would have been more appropriate, perhaps, but in the heavier ones, such as Edgardo (Lucia di Lammermoor) and Arturo (I puritani), Kraus's power, maturity, and masculinity were welcomed – no tenorino here. His bright, trumpeting voice and exciting high notes were tempered by a sunny suavity. On the other hand, he could be a rather bland interpreter. Given his excellence in the French repertoire, in particular, it is tempting to go as far back as Georges Thill when looking for comparisons. Kraus died in 1999. Most of these selections are taken from Kraus's complete recordings; the exceptions are the two indicated above from 1987, which were recorded at this Paris Opéra. (Frankly, it is a shame that Kraus left commercial recordings of neither L'Elisir nor Faust.) This means that Kraus is joined by excellent singers, including Montserrat Caballé in I Puritani, Renata Scotto in La bohème and La traviata, and Beverly Sills in Rigoletto and Don Pasquale. The selections have been chosen well, although, as with the other releases, there are some untidy fade-in and fade-outs. With the exception of Così, the engineering remains bright and shiny. This is an excellent compilation, and for those who are less familiar with Kraus than with the "Three Tenors," this might whet their appetite for more. 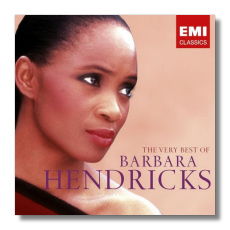 With Barbara Hendricks, EMI Classics had the interesting challenge of a singer who has recorded relatively little of her (not particularly large) operatic repertoire for the label. Furthermore, the roles that she has recorded for EMI (Sophie in Der Rosenkavalier, the Sandman in Hänsel und Gretel, etc.) generally don't lend themselves well to excerpting – but could they at least have included some of Leila's music from Bizet's The Pearl Fishers? Instead, five of the six operatic arias are taken from a recital album – apparently now out of print – that Hendricks made with conductor Paavo Järvi and the Philharmonic Orchestra of Radio France. There are six excerpts from an album of "Sacred Songs" which she recorded in Sweden, four spirituals from her relatively early album with pianist Dmitri Alexeev, and, on the second disc, a nice selection of Lieder, mélodies, and other songs, including an interesting orchestral version of the famous Vocalise-Étude en forme de Habanera, and Delibes's Les Filles de Cadix – a favorite of mine – which simmers sultrily, where it is more conventional to scintillate. Hendricks is never anything less than lovely and insightful. Hendricks, who was born in Arkansas in 1948, is widely regarded for the angelic purity of her voice. She is anything but a twitterer, though – it is the warmth of the voice that makes it truly heavenly. After completing an undergraduate degree in Chemistry and Math, she went to the Juilliard School of Music, where she studied with Jennie Tourel. Her European debut came in 1974 at Glyndebourne. In 1978, Herbert von Karajan asked her to be the Voice from Heaven in his production of Don Carlo (also recorded by EMI Classics), and, for good or ill, that appellation has stuck with her ever since. Although it is perforce quite light on the operatic excerpts, this is a sensible compilation from EMI Classics. It is here that the absence of sung texts and translations is mostly keenly felt, however. (None of the "Very Best of" releases include anything but an essay in English, German, and French about the singer.) All of the Hendricks recordings are from digital originals, and are in very fine sound.